it should be noted that some of the grid lines are hidden due to alignment with borders. but i prefer the backtics. which simply deletes all blank lines. since ^ represents the beginning of all lines and $ represents the end of all lines, ^$ then represents those lines with nothing in between ^ and $ i.e. blank lines. as always the `d’ command instructs sed to delete this line. notice the comma after 3.
this time we are using the subsitute command `s’ and asking sed to replace the last comma by a ). as you already know $ represents the end of the line so (,$) represents the last comma we substitute those with a right bracket ) and a newline character `\n’. sed -e "s/^/set $whichTics (/"
notice the double quotes instead of the single quotes. we use double quotes so that $whichTics is automatically expanded to the user supplied tics name. 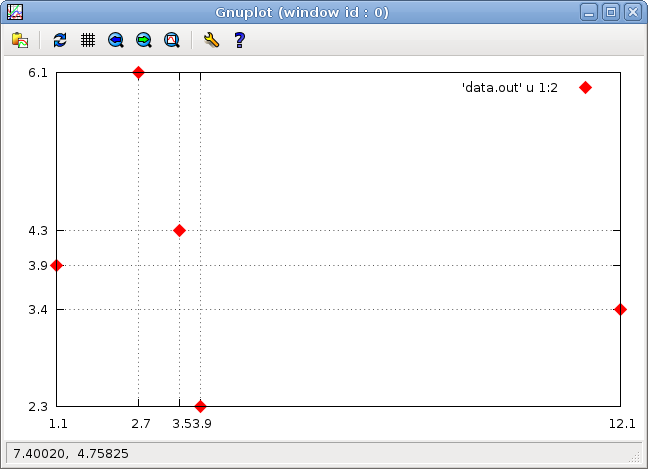 gnuplot tool is an amazing tool. I tried to plot real-time data with this tool using some scripts. But it is not quite good. If you have come across any real-time plotting tool in linux, please let me know. hi srinu, i m not quite clear about ur question. do u mean real time stamped data or data coming in from a data stream such as a data aquisition card? I wanted to plot a stream of data coming from a card, not the data with the time-stamp. BTW, where are you? what are you doing. This is precisely what I was looking for. Thank you!